President Obama came saw and triumphed in Ireland on Monday. In the process he forged a new identity that connects him even closer to the great American dream. He has been accused of being a Muslim, of having no birth certificate, of being somehow non-American. On Monday he produced the long form birth certificate of Fulmouth Kearney his predecessor, and in the process. Fulmouth’s story became part of the American story too. By finding his Irish family, no matter how remote, Obama tapped into a classic American narrative of an American returning back and finding his roots. Americans know one thing, that their presence in America started , in most cases a generation or more ago when a young man or woman, packed a small suitcase, said farewell to his or her family and headed off into the great unknown. All the great dynasties, from the Mayflower emigrants on down ,started with such a voyage into the unknown. So did every sweat blood and tears American small success story. That diorama is part of the American psyche, embedded deep in the DNA of all of us who share this blessed country. There has been a concerted effort to deny Obama that heritage, to proclaim him as alien and outside the American dream. In Moneygall he shattered that smear forever. His ancestor Fulmouth Kearney, was one such man, who departed his little native village of Moneygall in 1850 and created his own American dream by taking up land in Ohio. His descendants lived quiet lives until one of them, Barack Obama, shattered the glass ceiling that said no man of African American heritage could become president of the United States. Obama’s autobiography ‘Dreams of my Father’ and his early writings had all concentrated on the Kenyan side of his heritage, an understandable track given that his father had deserted the young man and left a deep void in his life, one he wanted to fill and understand. Now as president far more focus is being given to his mother Ann Dunham’s family, where the Fulmouth Kearney connection kicks in. Obama embraced those Irish roots on Monday. Gone was the cerebral, professor-like mien that has marked his years in office, a cool distant figure. In its' place was a smiling , beaming, hugging, handshaking president who had , for a day at least, had absorbed some of the Bill Clinton ability to connect on a visceral level with people. Ireland tends to provide an emotional transplant for politician. The JFK visit in 1963 kicked off the notion of a Ireland as a place where policy issues are not the main agenda, but the creation of a powerful emotional back story is. Obama succeeded in creating that back story in Ireland, of embracing a heritage and history he shares with 40 million others who have Irish ancestry. 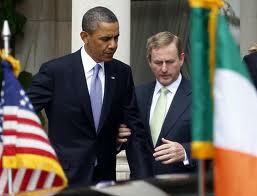 It was a great day to be Irish for Barack Obama.